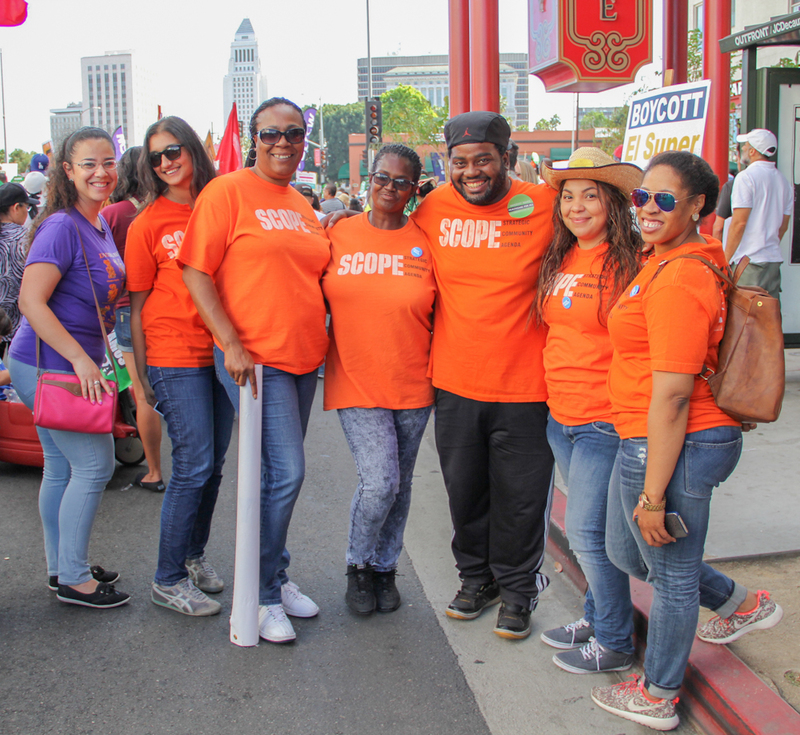 For SCOPE, 2015 was a year of victories benefiting working families in Los Angeles, including an increase in the minimum wage to $15 an hour and the passage of wage theft enforcement policies that protect the city’s most vulnerable workers. 2015 was also the first full year that eligible individuals could change their records under Prop 47. Building upon last year’s historic win, SCOPE organized resource fairs and legal clinics to help South LA community members change their records. This year at the state, SCOPE helped ensure the passage of landmark legislation that dramatically increases California’s energy efficiency and clean energy goals–a win for our most polluted and vulnerable communities. Through grassroots organizing, voter outreach and supporting our allies, SCOPE is building a grassroots movement that creates sustainable change and improves the quality of life for South LA residents. SCOPE’s 2015 work builds upon effective economic policies and job models that target disadvantaged workers and low-income communities of color. With the RePower LA Coalition, we’ve called for an increase in investment and training opportunities for utility pre-craft trainees (UPCTs) at the Los Angeles Department of Water and Power (LADWP). The UPCT program remains the model across the state for green job career path development for workers with barriers to employment. Expansion of green job training can result in an expansion in access to greener services, like solar energy, which is currently inaccessible to most South LA residents. This year, our ongoing work to connect South Los Angeles residents, churches and small businesses to LADWP’s free energy-saving programs was highlighted on Univision and SCOPE’s team of outreach workers were featured on billboards around South LA. SCOPE members, Maria Dubon and Landry Thomas review what kind of environmentally friendly improvements can be made at a South LA Church. At the state level, SCOPE has worked with SB 535 Coalition partners to help shape Greenhouse Gas Reduction Fund (GGRF) program guidelines and our members have advocated at multiple regulatory hearings to ensure that the needs of communities on the frontlines of climate change and disinvestment are addressed in ongoing GGRF investments. During the legislative cycle, SCOPE met with the offices of Assembly members Reginald Jones-Sawyer, Sebastian Ridley-Thomas, Mike Gipson, Autumn Burke, and Senator Holly Mitchell to express the concerns and priorities of South Los Angeles’ families. Over the summer, SCOPE talked to close to 2,900 South LA voters in Jones-Sawyer, Gipson, and Ridley-Thomas’ districts about critical climate policies to extend the goals of AB 32 (SB 32) and to increase our state’s petroleum reduction, renewable energy, and energy efficiency goals (SB 350). We identified 1,648 climate policy supporters and 535 South LA voters contacted their elected official to share their support for these policies. Throughout the year, SCOPE has been engaging voters and community members to better understand the priorities of low-income communities of color and build a climate conscious base of voters. The majority of those voters believe that climate change is a threat to the economy and support public investment that creates an equitable clean energy economy. In 2015 alone, we identified over 9,000 South LA climate conscious voters who support targeted investments that address climate change and create jobs. Through our civic engagement strategies and research, we found that low-income communities of color – and Black voters in particular – are concerned about climate change, support strong action on climate issues, and feel that issues of climate and economic and workforce development go hand in hand. In addition to our work on climate policy, SCOPE, along with more than 40 community groups, labor unions, and faith-based organizations joined California Calls in fighting for our state’s future with the “Make it Fair” campaign. As an alliance, we are laying the groundwork for a revenue campaign to close the commercial property tax loopholes that are exploited by corporations through Proposition 13. The much needed money will be invested back into public schools, hospitals, and other local services that are critical in our communities. Training and technical assistance is critical for achieving SCOPE’s movement-building goals to scope and scale. SCOPE is fully committed to contributing to the capacity building of allies waging campaigns towards health and economic equity for communities of color throughout the nation. In 2015, SCOPE also amplified the capacity of our movements by sharing our tools, methodologies, and practices for grassroots building and systemic change with over 60 organizations and networks. This year we focused our efforts on: building the movement around the adoption and implementation of the Los Angeles City Wage Theft Enforcement ordinance; strengthening a national network of local organizations fighting for healthy school environments; developing strategies for restorative justice and community representation in the California Central Valley; and growing voter engagement programs to win reproductive justice policies across California. 2015 was an amazing year for us! With 2016 right around the corner, we’ll be hitting the ground running to ensure that our movement for social justice is bolder and more sustainable. Thank you for your support.